Are you in the market for your first home in North Carolina? Would you like to know about state and local programs that have been created to help you purchase that first home? If you answered yes to these two questions, there is great news for you. The state of North Carolina provides incentives – mostly financial assistance – for its residents who are first time home buyers and need help with the down payment and closing costs. It will be well worth your time to educate yourself about the programs that the State of North Carolina provides. The agency in North Carolina that provides assistance to 1st time home buyers is The North Carolina Housing Finance Agency. There are no outright grants available, but there is one program that is very close: The American Dream Downpayment Initiative. 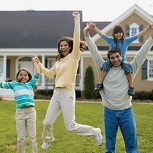 You can receive up to $8,000 for use toward the down payment and closing costs. This is actually a loan, but carries no payments and has a zero percent interest rate. The $8,000 doesn’t have to be paid back for 30 years. In effect, you are getting a grant of the value of interest on a $8,000 loan for 30 years, which at 7% interest rate, amounts to over $9,700 in interest that you would save. To find out more about this program, please visit the North Carolina Housing Finance Agency website. In addition to the grant programs described above, the U.S. Department of Housing and Urban Development provides home buyer assistance and grants in every state. There are several programs designed specifically for people that meet certain requirements, such as grants for people with disabilities so they can continue to live independently at home. It is worth visiting HUD’s website to see what assistance is currently available. For your convenience, simply go to this page. Do you need financial assistance to pay for home repairs? Would you like to buy a home and be able to make affordable low interest payments? Are you homeless? If you answered yes to any of these questions, then you may qualify for programs offered by Cumberland County Community Development. The Individual Development Accounts (IDA) Program is a savings program in which the City provides matching grant funds toward the purchase of a home. The IDA Program teaches a pattern of savings to enable low wealth households to reach the goal of homeownership by saving for a down payment on a new home. As a part of the intake process, individuals who intend to particiapte in this program will be referred to a housing counseling agency who will provide one-on-one counseling services and initiate the savings plan. For more information, please review the IDA Program Guidelines. To begin your savings plan please call (919) 560-4570, ext. 22244. Assistance packages are available of up to $5,000 for each qualified applicant who completes the City of Durham’s Homeownership program. Another incentive is a Homebuyer’s Assistance Program through the City of Gastonia. They will match the escrow funds up to $3500 to be used for down payment and/or closing costs. The Greensboro Affordable Home Loan Initiative (GAHLI) is a program that provides homebuyer counseling, education, and financial assistance to low and moderate income first-time Greensboro homebuyers. Funding is provided from the US Department of Housing and Urban Development and the City of Greensboro. GAHLI is administered by the Greensboro Housing Counseling Service (GHCS). 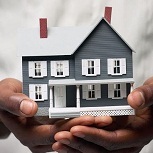 The goal of GHCS is to serve approximately 40 households annually with home purchase support. 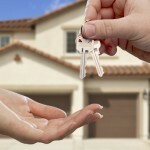 Applicants are taken through a three-step home buying process. If you are a qualified low to moderate income applicant who currently resides outside the corporate limits of the City of Hickory, or who has lived within the corporate limits for less than one year, there is a program that may assist you in the purchase of a new or existing home located within the City limits of Hickory. The Homebuyer Assistance Program provides affordable homeownership opportunities for first-time, very low-to-moderate income buyers, providing deferred, low-interest loans to reduce out-of-pocket cash costs for down payment, closing costs, and pre-paid expenses. The program does not include providing assistance with earnest pay/good faith deposits that may be required by a Realtor or former homeowner to hold property. The program requires the homebuyer to receive an approved loan from a participating lender; be income eligible for the program (80% or below the area income median); purchase a home within the City limits; provide $500 of their own funds toward the purchase. The program cannot be used to purchase a home that exceeds 95% of the area meadian purchase price for a single family home. City-Wide Down Payment and Closing Costs Assistance shall apply to all down payment and closing cost assistance programs. This replaces all former tiered programs. The amount shall not exceed a maximum level of $5,000 for a home located within the High Point city limits. Terms include a three-year deferment at 3% interest for 5 years. Additional incentives are offered in revitalization areas. The Second Mortgage Program operates in tandem with a local 501(c)(3) organization sponsoring, developing, or serving as an advocate for the potential homebuyer. The first-time homebuyer must live or work in Orange County for at least one year prior to home purchase. Loan amounts cannot exceed 30 percent of the house sales prices with the average loan ranging from $15,000 to $20,000. 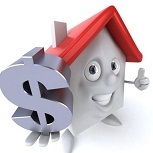 The income of the homebuyer must be below 80 percent of area median income. For further information, contact this office. The Individual Development Account (IDA) Program fosters housing opportunities for the low wealth residents of Orange County. Individual Development Accounts are dedicated savings accounts, similar in structure to Individual Retirements Accounts that can be used for purchasing a first home in Orange County. Families participating in the program receive financial counseling, tips on household repairs, and matching funds on savings for down payment and/or closing costs. The IDA Program matches savings at a ratio of 2:1 not to exceed $2,000. 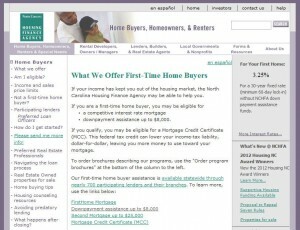 This entry was posted in First Time Home Buyer Grants, First Time Home Buyer Info, First Time Home Buyer Programs and tagged closing cost assistance, down payment assistance grant, down payment grants, NC 1st home buyer programs, North Carolina Housing Finance Agency. Bookmark the permalink.